I’ve got a new best friend and his name is Ashley. I’ve met my new bff at an event before Christmas at the Chanel counter in Harvey Nichols in Manchester, where this angel was helping us ladies to choose the perfect red lipstick. I was anyway too curious and decided to give it a go so I took a sit. I was of course hypnotised by all the make up, the brushes, that MIRROR, why I cannot have a dressing table like that?? Anyway, this is when I met this very talented MUA that after a quick look picked up what he though was the best red to suit my skin tone. Chanel has got an amazing range of red lipstick and what Ashley got for me was just spotted on. Applied by the expert brush of my fantastic friend, this is a very rich red with a blue undertone. It’s not the usual flat red, stands out nicely on my warm skin tone. The lipstick itself doesn't really need my introduction, rouge allure is so creamy and smooth, is a pleasure to have it on the lips and will last a decent couple of hours without fading and without drying out my lips. So if you want to have good advices about make up I can totally recommend you to go and see Ashley in Harvey Nichols in Manchester, I am sure you will not be disappointed! 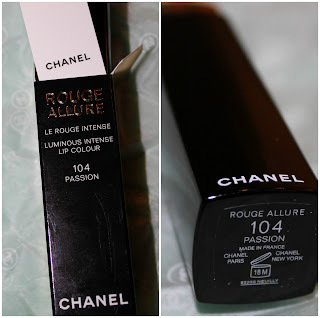 The rouge allure retails for £ 25 approx...damn you Chanel, why you have to be so expensive? Save it for a birthday treat or a special occasion present, I am pretty sure you will find a good reason why you deserve it, I always do. Now, next on the list is the new Tom Ford collection, any other nice lipstick I should treat myself with? Hahaha! That red is delicious, I think Ashley really is your best friend. I luuuurve Chanel make-up, just so covetable. Sarah I wish I could have him doing my make up every day! Okei, i need to go to the Uk. Here it is even 35£. What???? That is too much really!